Pillows, check. Lamps, Check. Magazines,check.Tea towels,check….. Cloches,check! I once got into an argument with an 85 year-old lady I worked with over whether it was called a cloche or a bell jar. She actually got kind of riled up over the whole thing, and I thought she was going to take me down with her suitcase-sized purse, so I just let it go. Not. Worth. It. I didn’t want to tell her cloche is French for bell. Not sure what else you can put under glass? 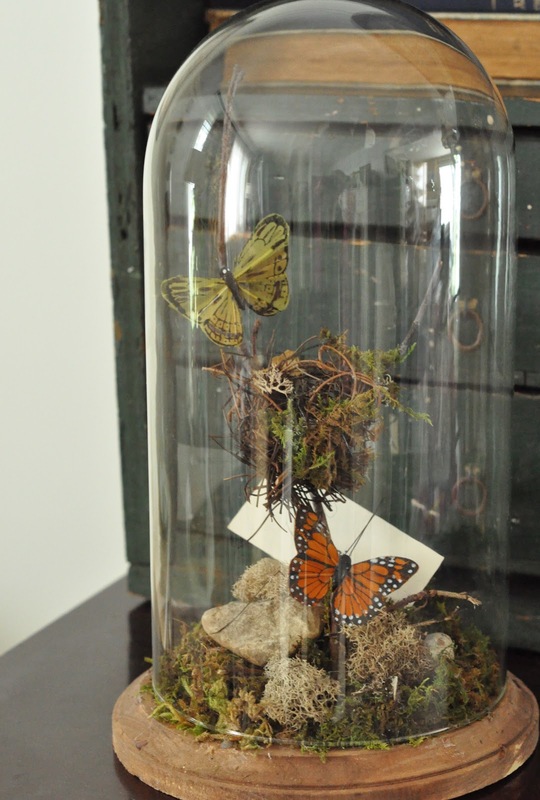 You can see more bell jars,display ideas and cloches on my pin board. too funny! I still haven’t converted my clock to a cloche yet, I mean bell jar, I mean cloche. I’m kinda obsessed with them right now too. you can add trays and terrariums on my list of obsessions too. ;) have a great one! Love all the ideas for filling a cloche. Now I’m off the see what I can do with mine for spring! These are so sweet. I love cloche’s/bell jars too!!!! These gave me some inspiration for mine. Happy Easter. I love cloches, too, Jen! I have several throughout my home and I never did have them until I started blogging. Another addiction to blame blogging for! : ) Whenever I see a dome clock for a good price at Goodwill, I try to get it to makeover into a cloche. Last year I found a bunch of just the domes at Salvation Army. I wound up selling them but wish I had bought all of them now. OH I have been in love with cloches/bell jars since I started to work on my horticulture degree back in 1994. Our instructor had a collection that she used in her garden… yes she had real authentic glass garden cloches… some were imported from France, others were ones she had found at flea markets some 20 years earlier while in France. 20 years later and I still adore them. Do I own any? Not really. Well sorta…. it wasn’t a cloche in its 1st life but it is now. Thank you for sharing all the ideas! Beautiful images!! 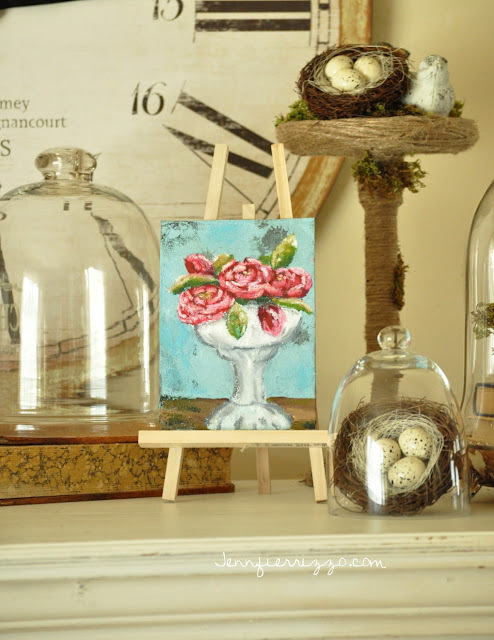 I love decorating with cloches! Everything looks better under a cloche! Swoon! I’m always looking for new cloche covering ideas!! I may use one for my Easter centerpiece. That’s hilarious! I feel like I’ve had this same conversation with my husband! That’s a great collection of cloches!! They are all so pretty! I too am not ashamed of my Goodwill cloche;) Well maybe it did come from a clock, hehe! Oh yes, I’m loving the cloche look. Sadly I don’t have a single one! Something I must right asap. LOL. Yes, I am obssessed with cloches. I can’t resist buying them when I see one. It’s an addiction! I love cloches too. I don’t have nearly enough of them! Oh wow, looking through your post I thought you had an impressive collection of cloches! Lucky you!! Then I noticed the links…to your pin board…oh well, you can still dream, and I’ll dream right along with you. Love cloches and made a couple out of vases ’cause I can’t afford the price of most of them. love, love, love cloche’s !!!!!!! You’d think being an older lady that she’d be at least familiar with the ‘bell’ shaped hat called a ‘cloche’, lol! These are some really nice ones Jen!! I love a good cloche, or two! !